Israeli forces fire toward Palestinians near Ramallah, West Bank, during a 20 December protest against U.S. President Donald Trump's decision to recognize Jerusalem as the capital of Israel. Pope Francis and Turkish President Recep Tayyip Erdogan spoke by telephone on 29 December about the status of Jerusalem. Paloma Garcia Ovejero, vice director of the Vatican press office, confirmed the telephone conversation took place and said the call was Erdogan’s initiative. The Turkish newspaper Hurriyet reported that Erdogan and Pope Francis both expressed satisfaction with the U.N. resolution on 21 December calling on the United States to rescind its recognition of Jerusalem as the capital of Israel. The resolution passed 128 to 9, with 35 abstentions. U.S. President Donald Trump announced Dec. 6 that he was formally recognizing Jerusalem as Israel’s capital and ordering the State Department to begin preparations for moving the U.S. embassy from Tel Aviv to Jerusalem. The Vatican supports a “two-state solution” for the Holy Land with independence, recognition and secure borders for both Israel and Palestine. While insisting access must be guaranteed to the holy sites of Christianity, Judaism and Islam in Jerusalem, the Vatican, like most nations around the world, believes political control of the city should be settled in Israeli-Palestinian peace talks. “May the Lord also sustain the efforts of all those in the international community inspired by goodwill to help that afflicted land find — despite grave obstacles — the harmony, justice and security that it has long awaited,” the pope continued. Christians in Baghdad, Iraq, celebrate Christmas after Mass on 25 December. Catholic patriarchs of the Middle East called for peace, security, prayer and solidarity at Christmastime. Catholic patriarchs of the Middle East — with hope, despite uncertainty in the region — called for peace, security, prayer and solidarity at Christmastime. From Baghdad, Chaldean Catholic Patriarch Louis Sako expressed hope for a “new phase” for his country, that the recent triumph over the Islamic State and the termination of terrorist control of Mosul and other Iraqi cities is a step toward security and stability. Patriarch Sako reiterated that before the American-led invasion of 2003, there were more than 1.5 million Christians in Iraq. More than half of that Christian population has migrated due to discrimination, threats, abductions and the expulsion from their homes in Ninevah Plain by the Islamic State in 2014, he said. “This is our homeland and we insist (we) remain here,” he said. “So, let us move to the path of hope together,” Patriarch Sako said. “In regard to Muslims, an honest dialogue is a must, to understand the truth of each side and accept it,” he said. In his Christmas message, Lebanese Cardinal Bechara Rai, Maronite patriarch, also touched upon Trump's declaration regarding Jerusalem. He added that “there is still a lot to do that would inspire confidence to our eradicated and exhausted community in order to return to their ancestral land” in Syria and Iraq. Chaldean Christians in Mosul, Iraq, attend Christmas Mass at St. Paul Cathedral on 24 December. 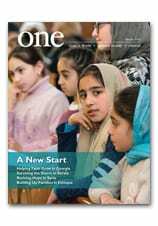 Here’s an early Christmas gift we’re delighted to unwrap for you: the latest edition of CNEWA’s award-winning magazine, ONE. You can watch Msgr. Kozar’s video preview above. And you can read our digital version right here. This edition has a rich trove of compelling stories, profiles and photographs. You can visit Ukraine and meet the devoted priests and lay people nurturing the church and helping it grow, often under surprising and very modest circumstances. You can discover the inspiring ways young Ethiopians are putting down roots and learning there’s no place like home. And you can meet a man some call the “Archbishop of Jesus” and hear his account of the challenges and joys of leading the flock in Galilee. All this, plus insights from a priest in India — a man of the poor, serving the poor — and Msgr. Kozar reflecting on the enduring faith of Ukraine — while sharing his own poignant photographs. We hope you enjoy this edition of ONE — and send it along to you with our prayers, gratitude and good wishes for the Christmas season and the new year to come. The centerpiece of the Vatican’s Christmas holiday decorations is the towering 92-foot spruce tree. Measuring nearly 33 feet in diameter, the tree was donated by the Archdiocese of Elk, Poland, and transported to the Vatican on a flatbed truck traveling over 1,240 miles across central Europe. “The tree, which comes from Poland this year, is a sign of the faith of that people who, also with this gesture, wanted to express their fidelity to the see of Peter,” the pope said. Iraqis shop for Christmas decorations in Baghdad on 16 December. Many Christians in northern Iraq are celebrating their first Christmas since the region’s liberation from ISIS. Thank you, Caritas — and thanks to all our friends and donors from around the world who make it possible for us to “be with” Caritas and the people of Georgia when they need us!